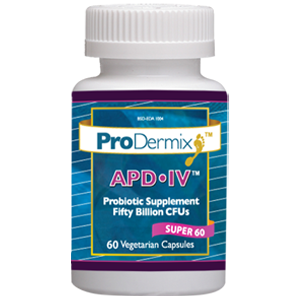 This formula contains 3 SUPER potent probiotic strains. APD IV helps to sooth Colitis, Crohn’s, IBS, and UTI Infections. Vegetarian capsule (hydroxypropyl methylcellulose, water), proprietary polysaccharide complex, and L-leucine. Free of wheat/gluten, corn, yeast, soybeans, casein, eggs, fish, shellfish, tree nuts, and peanuts, no sugar and artificial sweeteners, colors, flavors, or preservatives. Take one capsule daily with cold water or as directed by a healthcare professional. L. casei has been found to have protective activity against pathogenic listeria bacteria. Lactobacillus casei beneficially modulates innate immune responses. Increases the number of intestinal IgA-producing cells. Antagonizes Helicobacter pylori. Decreases cytokine secretion. 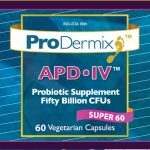 Inhibits E. coli adherence to intestinal cells. Decreases Shigellamediated inflammation. This is the most ferocious good bacteria, known to produce organic compounds including lactic acid, hydrogen peroxide and acetic acid that halt reproduction of dangerous bacteria. Yeast (candida) is crowded out when hydrogen peroxide and aecetic acid are present. It synthesizes B-complex vitamins & absorbs calcium. Another study suggests it helps prevent eczema. More recent research says it controls diseases caused by allergic reactions.